Famed drumming brothers Carmine and Vinny Appice will perform songs from their first and newly released joint studio album Sinister at the 2018 Hall Of Heavy Metal History Celebrity Induction Ceremony, January 24, 2018. This great collection is comprised of 13 tunes, and has numerous high profile musicians on all tracks. "Carmine has been singing lead and background for years. He´s a very good singer and I´m glad he sang one number on this record," says Vinny Appice. "We cannot wait to take the album on the road! Heavy drums and heavy songs. It will kill," says Carmine Appice. The APPICE Sinister album is available through SPV/Steamhammer as CD digipack, double gatefold vinyl, download, and stream. 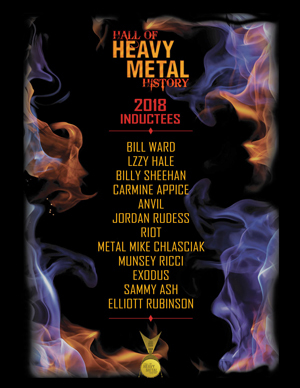 Tickets for the 2018 Hall of Heavy Metal History Celebrity Induction Ceremony are available at www.thehallofheavymetalhistory.org The show is sponsored by: Pepsi, KLOS FM, TD Bank, SiriusXM, Modern Drummer, TotalRock.com, Riola Design, Zildjian Cymbals, Playability Toys, Metaltalk.net, and Marshall Amps.